Reference number for this case: 4-oct-54-Megrit. Thank you for including this reference number in any correspondence with me regarding this case. The author indicates that after November 1, 1954, "Henry Lebrisse, of Aude", reported a small saucer of about three feet in width, containing midget-like entities, in his barnyard. The saucer took off on sight. Two human forms, which looked like children, were observed by a farmer named Henri Lehrisse [sic] to land in his courtyard in a saucer only one yard in diameter. The machine remained in the yard only a few seconds before flashing out again. Jimmy Guieu indicates that on October 5, 1954 in the night in the Côtes du Nord, a young farmer saw posed in the court of his farm a discoid apparatus of low dimension, and by a kind of port-hole, he undistinctely saw two motionless human forms of the size of a child. Darkness did not enable him to distinguish the precise aspect of these small beings. The apparatus stayed only one moment and took off. Aimé Michel reports that on October 4, 1954, in Mégrit, Mr. Henri Lehérissé went outside at about 10:00 p.m. to make his horses drink. Surprised by a strange light, he looked up and saw at about fifty meters above a hangar, motionless in the air, a flat, luminous, object of metal appearance, with a diameter he estimates as 2 meter 50. At his approach, the object quickly moved away. Mr. Lehérissé thought of having seen black shadows agitated as in transparency in the luminous mass. The bolded part is the part related to this case. Oct. 04, 1954, evening, Trégon (France). Several people noticed an object hovering near a hilltop. They drove to the site, but it flew away. What seems to be the same object was seen at Megrit, 25 km to the southwest, hovering over a farm. It was described as metallic, flat, emitting light. Jacques Vallée indicates that on October 4, 1954, in the evening, several inhabitants of Tregon noticed an object which seemed to hover near the top of a hill. They drove to the site, but the object flew away. What seems to be the same object was also seen at Megrit, about 15 miles south­west of Tregon, hovering above a farm. It was described as metallic, flat and emitting light. The authors indicate as source their personnel file and newspaper clippings for this observation in Mégrit in the Côte-du-Nord on October 4, 1954 at 10:00 p.m. They tell that a farmer of this village, Mr. Lhérissé, aged 23, cames out of his stables where it had just taken care of his horses, when he became pzzled by a strong gleam close to one of his hangars. He approached, fearing a beginning fire, and then discovers a machine of approximately three meters in diameter, with luminous and metallic reflections. Not frightened at all, but curious, he approached and distinguished two silhouettes "the size of a child," which almost at once disappeared in the machine. The machine moved away at high speed. The two authors present the case of October 4, 1954 in Megrit by noting that two sources report two different versions of the incident, and quote these two sources. They are Aimé Michel on the one hand, and Garreau and Lavier on the other hand. They then indicate that the sources are case 192 in Vallée's catalogue; the book "A propos des Soucoupes volantes" by Aimé Michel, page 175; the book "Face aux ET" de Garreau et Lavier pages 137-138. They then present a third version which they indicate to come from the newspaper Le Provençal for October 3, 1954 and which tells of a "machine, in the farmyard of the witness, of a diameter of one meter approximately, inside whose two motionless human forms of the size of a child appear." It was guessed that the object seen near Tregon was the same object that showed up at Megrit where a flat, metallic-looking, thing was seen hovering over a farm at a height of only 150 feet. The town of Megrit is only 20 miles or so to the southwest of Tregon. 45. 44. Paris, France. Le Parisien. 7 October 54. Jean Sider indicates that on October 4, 1954, at 10:00 p.m., in Mégrit, Côte-d'Armor, Henri Lehérissé left his place to make his horses drink, when a strange light attracted his glance. Looking up, he saw that the light came from a flying machine hovering 50 meters above a hangar. It was a flat object of metallic appearance and a diameter of approximately 2.50 meters. The witness claimed to have been able to distinguish black forms moving through the transparency of the luminous mass, according to a second source. Jean Sider indicates as ufological sources " Figuet, pages 122-123" and Aime Michel, page 175. He notes that Figuet indicates two other sources, case 192 of the Vallée catalogue, and the newspaper Le Provençal, of Marseilles, for October 3, 1954, that is to say 24 hours before the incident, thus Sider wonders whether it was a mystyping or a mixture of files. M. Leherisse observed a flat, luminous, metallic looking object, 7, or 8 ft wide, hovering 150 ft above a garage. He could see dark forms moving about like shadows in the lighted mass. As he approached it, the object rapidly moved away. Donald Johnson indicates that on October 4, 1954, Several people noticed an object hovering near a hilltop in the evening in Tregon, France. They drove to the site, but it flew away. What seemed to have been the same object was seen at Megrit, 25 km to the southwest, hovering over a farm; which was described as metallic, flat, and emitting light. Donald Johnson indicates that the source are Aime Michel, Flying Saucers and the Straight Line Mystery, p. 139; Jacques Vallee, Passport to Magonia, p. 217. I remember this apparance very well. Another person was witness of this appearance the owner of the neighboring farm "La Petite Métairie" Mr. [first name and name retained] Michel Lehérissé was resident of the farm "La Grande Métairie". I was 11 years old at the time and this created quite an uproar in the village. During my summer holidays I kept the cows in the farm "la Petite Métairie". I did not witness these apparitions. I believe in these people whom I have known very well. (Many thanks to Mr. R. for this information). Jerome Beau indicates that on October 4, 1954, in Tregon, France, several people saw an object "seeming to fly over above a hill." They went there by car but it had disappeared. What seemed to be the same object is seen in Megrit, 25 km in south-west, flying over a farm. It is described like a metallic object, flat, emitting light. Jérôme Beau indicates that his source is Le Parisien, October 7, 1954. Luc Chastan indicates that in the Côte d'Armor in Mégrit on October 4, 1954 at 22:00 hours, there was an observation with two versions depending on the authors. "According to Aime Michel - The witness leaves home to make his horses drink. Surprised by a strange light, he looks up and sees the craft, motionless in the air, at about fifty meters above a hangar. The witness believes to see black shapes inside which are agitated as in transparency in the luminous mass." "According to Garreau and Lavier - The witness leaves his stables where he had just bandaged his horses. A strong gleam intrigues him close to one of his hangars. He approaches fearing a fire. He discovers the craft then, approaches. He distinguishes two silhouettes of child size which, almost at once, disappear in the craft. The latter moves away at high speed." He adds: "An email received by the website 'UFOs at Close Sight' specifies that two other people are said to have seen the object." The sources are indicated as "Ovni, Premier dossier complet... by Figuet M./ Ruchon J.L. ** Alain Lefeuvre pub. 1979" and "Les OVNI vus de près by Gross Patrick ** http://ufologie.net". The website indicates that on 4 October 1954 at 22:00 in Megrit, France, "Shadows seen moving inside flat luminous, metallic object, 7-8' wide, hovered 150 feet above garage."" And: "At 10:00 p.m. Mr. Henry Leherisse, age 23, in Megrit, France saw two shadows moving about inside a flat luminous, metallic, three-meters wide object, that hovered 50 meters above his garage." And: "An object was observed. Occupants of the craft were seen. One luminous object, about 10 feet across, around 100 feet away, was observed by one witness for two minutes (Leherisse)." And: "M Leherisse observed a flat, luminous, metallic looking object, 7, or 8 ft wide, hovering 150 ft above a garage. He could see dark forms moving about like shadows in the lighted mass. As he approached it, the object rapidly moved away." The sources are noted as Webb, David, HUMCAT: Catalogue of Humanoid Reports; Michel, Aime, Flying Saucers and the Straight-Line Mystery, S. G. Phillips, New York, 1958; Vallee, Jacques, Computerized Catalog (N = 3073); Vallee, Jacques, Challenge to Science: The UFO Enigma, Henry Regnery, Chicago, 1966; Vallee, Jacques, Preliminary Catalog (N = 500), (in JVallee01); Schoenherr, Luis, Computerized Catalog (N = 3173); Delaire, J. Bernard, UFO Register Volume 7 (1976), Data Research, Oxford, 1976; Newspaper Clippings; Rosales, Albert, Humanoid Sighting Reports Database. *Oct. 4, 1954 - At 10:00 p.m. Mr. Henry Leherisse, age 23, in Megrit, France saw two shadows moving about inside a flat luminous, metallic, three-meters wide object, that hovered 50 meters above his garage. 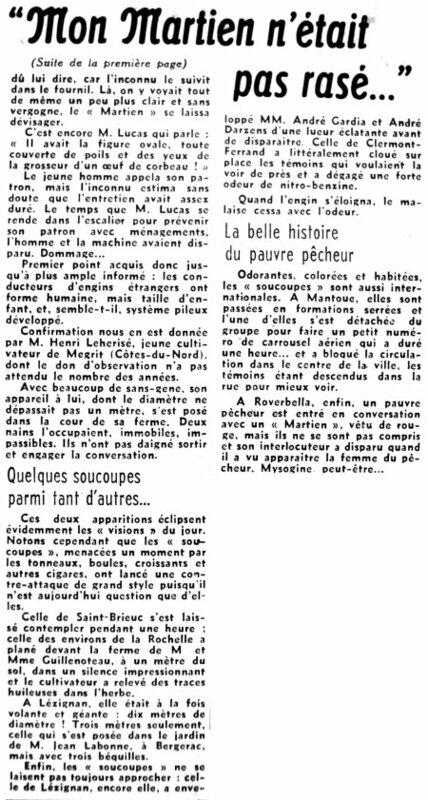 (Source: newspaper clipping, October 7, 1954; Michel Figuet and Jean-Louis Ruchon, OVNI: Le premier dossier complet des rencontres rapprochees en France, pp. 122). I contact you about your article in reference. I come from Megrit and it so happens that this we [weekend] we were at my father's who still lives there. My father's companion is the sister in law of Henri Leherisse the person who saw the ufo in the farm of the petite métairie. So is is not Michel like some articles let think. Henri is still alive, he lives in [-] and spends his holidays in Megrit, we had lunch with him this we [weekend], and he told us what he had seen. He was going outside to care for his horses when he saw an intense light, going closer he saw 2 black shapes quite small, with behing them a 'saucer' of metallic color with much light that was posed on three feet. He became scared and rushed inside his hom to come outside only the next day. The next day the saucer had disappeared, however there remained on the ground the print of the 3 feet which would have been seen by several people. That's the story he told us, it differs a bit from what I could read. If you want to get in touch again with mr Henri Leherisse, I do not have his address, however my father does, he is mister [Firstname Name] at the village of [City], street [Street]. Unfortunately, while it seems that there was an observation by Mr. Lehérissé and another person in Mégrit; which would have been of interest, the usual incapacity of the French ufologists to seriously document the cases of the 1954 saucer flap render the case practically meaningless. Indeed, for Aime Michel, silhouettes are seen in an hovering object, for Jacques Vallée, this is a UFO landing with no mention of occupants, and for Garreau and Lavier, objects and occupants are seen on the ground. so we have three contradictory versions by three different French ufologists. As none of them considered it useful to publish what the newspaper of the time said, whereas it seems to have been the only source at the time, I would really like to know how anyone can now say for sure what happened in Mégrit that night. In 2004, a reader who lived in the area at the time tells me that there were two farms in the village of Mégrit and their buildings were contiguous at the time. [le1] Article in the regional newspaper L'Est Républicain, France, 7 octobre 1954. 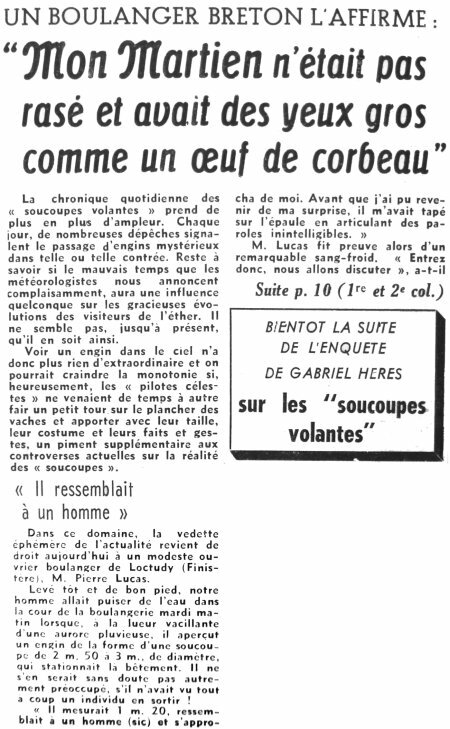 [---] Article in the national newspaper Le Parisien, France, October 7, 1954. [hw1] "Flying Saucers Uncensored, book by Harold T. Wilkins, Pyramid Books publisher, page 248, 1954. [am1] "Flying Saucers and the Straight-Line Mystery", book by Aimé Michel, English translation of "Mystérieux Objets Célestes", S. G. Phillips Incorporated publisher, USA, page 139, 1958. [jv1] "Un Siècle d'Atterrissages", article by Jacques Vallée, in the ufology magazine Lumières Dans La Nuit, France, numéro 43. [jv2] "The Pattern Behind the UFO Landings Report on the Analysis of 200 Documented Observations Made in 1954", by Jacques Vallée, chapter in "The Humanoids: A Survey Of World-Wide Reports Of Landings Of Unconventional Aerial Objects And Their Alleged Occupants", book by Charles Bowen, Neville Spearman publisher, 1969. [jv1] "Passport to Magonia - On Ufos, Folklore, and Parallel Worlds", book by Jacques Vallée, Contemporary Books publisher, France, page 217, 1969. [jg1] "Black-Out Sur Les Soucoupes Volantes", book by Jimmy Guieu, Omnium Littéraire publisher, France, page 195, 1972. [jv2] "Le Modèle Derrière les Atterrissages d'OVNIS - Rapport sur l'Analyse de 200 Observations Documentées Faites en 1954", by Jacques Vallée, "En Quête des Humanoïdes", book by Charles Bowen, French translation of "The Humanoids", J'ai Lu publisher, page 42, 1974. [gl1] "Face Aux Extraterrestres", book by Charles Garreau and Raymond Lavier, Jean-Pierre Delarge publisher, France, page 142, 1975. [am1] "Mystérieux Objets Célestes", book by Aimé Michel, Seghers publisher, France, page 191, 1977. [fr1] "OVNI - Le Premier Dossier Complet des Rencontres Rapprochées en France", book by Michel Figuet and Jean-Louis Ruchon, Alain Lefeuvre publisher, France, pp 122-123, 1979. [js1] "Le Dossier 1954 et l'Imposture Rationaliste", book by Jean Sider, Ramuel publisher, France, page 186, 1997. [pg1] E-mail of August 22, 2004, Patrick Gross, France, personal files. [pg2] Email for July 12, 2015, Patrick Gross, personal file. 0.1 Patrick Gross March 12, 2003 First published. 0.2 Patrick Gross October 17, 2007 Addition of the "Notes" and [pg1]. 1.0 Patrick Gross March 8, 2010 Conversion from HTML to XHTML Strict. First formal version. Additions [lc1], [ud1]. 1.1 Patrick Gross March 13, 2010 Addition [jg1]. 1.2 Patrick Gross May 31, 2010 Addition [le1]. 1.3 Patrick Gross June 22, 2010 Addition [jv5]. 1.4 Patrick Gross October 9, 2014 Additions [ta1], [ni1]. 1.7 Patrick Gross October 13, 2016 Addition [pg2]. 1.8 Patrick Gross October 29, 2016 Addition [er1]. 1.9 Patrick Gross December 18, 2016 Addition [lg1]. 2.0 Patrick Gross January 6, 2017 Addition [gb1].